Some BTBs seem to advocate Destino Bridal Gallery's fine service. You can just tell them your requirements and they will try their best to help in some ways. The BS (Wedding Acronym) allows you to pick brand new gowns from their collection. The customers are really happy with the quality of gowns. However there was a complaint about the shop mixing up the arrangement and causing inconvenience to the customer. Destino's photographers; Johnson Wee and Leno Ooi are both member of the Wedding & Portrait Photographers International (WPPI). PG Kok Ping is described as nice and patient. "Ladies just to share my bad experience with Destino bridal in JB. Package was pretty cheap my package was 3988RM. They have alot of nice pretty white gown but their EG is very limited and cannot make it. " "No doubt the PG was good my PG is kok ping he is really nice and patience but their service and MUA seriously CMI totally regret Make me feel that they are just after your sales and after that if you not happy with them or whatever is none of their business already"
"I am with Destino Bridal I love their works"
"If you are looking for bridal shop in JB, I would suggest the destino bridal gallery. 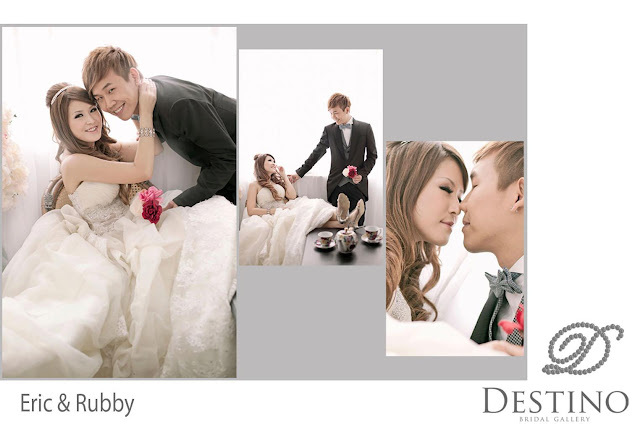 Nice gown, nice pictures, the style is different, and great services." "Hi.. I just signed up with Destino Bridal Gallery. I love their services and their wedding gown loads. No obligation. I could choose a wide variety of 1st hand gowns." Price range: RM3K++ to RM8K++ (AD wedding/ evening gowns, suits, flowers, car deco are included in the package. The difference is the size and quantity. i just taken my pre wedding photo,my make up artist is ms vicco,super like !! my pg is mr johnson,i like the way of their photo shooting,and the staff of destino very nice!! last year i had unpleasant experience with Destino...bad customer service. regret that we had signed the package. They are nice when pursuing u to sign up a package..talk like professional... but wait till when something went wrong...their face will change & hide in one corner hack care you... and always like to say "there is no such thing one, all along is like that one". But if asked other friend with experience then you will know they are lying. It seems that they have plenty of gown. however, when you go for the actual selection. then you will discover that most of the outdoor gown are old and thorn... and when you ask for more selection, then they will say.. most of our gown has gone out for shooting or lent out... eventually you will have no choice but select from those ugly gown..
so anyone who is visiting there beware of their empty promise & lots of exclusion that are hidden... once the package signed up and money collected... they will not bother about you and just do what they think they want to do... as they know that you only get married for once and will not return.. Thanks for the warning. and the tips for those visiting this shop. Thank you for the info..so what kind of bridal shop will you recommend to the soon to be marriage couple out there? If you are after the bridal shop that takes care of everything, here's a list to find the one that suits you. I think Victoria, Lasposa, Enya Mareine are worth considering, they get good comments too. I have sign a package with Destino Bridal as I heard that they provide a very good services, and let you try their gown even you do not confirm any package for you. I have been survey for a few Bridal shop and I really found that their sales skills is good (only before you sign the package with them). Because I only take photo shooting without any actual day wedding gown, hence they give me a RM300 discount on the package which cost me $4,599. Before I sign the package, Kelly was the one who serve me, (first time I go serve by Joelle), and show me a few nice gown and I straight away told her that this is the style I like, and she also give me a lot of suggestion n opinion as well. I don’t mind about the gown actually as I know the photographer and the album design and makeup artist is the most important part to me. If not, how pretty is the gown, but the photo is lousy, is still the same! 2nd time I went they to choose my gown, those I shortlisted from Kelly was prepared and let me test, other than that, all the gown they show me is those very old style gown and I’m not very happy about this oledi. Since I only need to choose 4sets – 3indoor + 1 outdoor, hence I also do not very choosy, just select those “okok” type and arrange for photo shooting date. 3rd time I go, is my photo shooting day, this is the most satisfied part throughout the whole process. The make up artist “Liffey” is a very nice lady and I give her freedom to design any hair style and make up that suit me. The photographer “Ah Xiang” and the PA also very nice guy, very patient to teach us pose, and take a lot of nice photo… also because of them, I take additional 10 photos which cost me another additional RM1,500 ( I think this is the most expensive additional charges as other Bridal shop do not charge that high)… the gown which I have selected 1 of them was giving me wrongly, and do not alter to my size… when I wearing it, it was very very…. Upset, but when I complaint to Joelle, she told me the photo can be altering until I satisfied…. What kind of answer is this? 1. 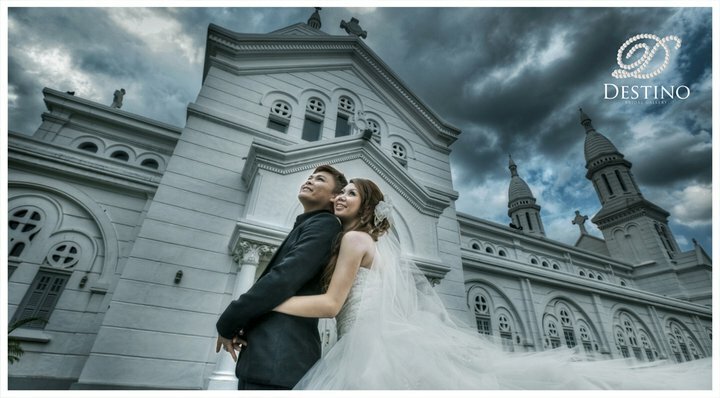 Top up RM1, 500 (instead of RM1,800) to get a big photo frame, and the photo will F.O.C to me. 2. Top up another RM1, 000 to take the photo if I do not want to choose option 1. And I know I have no choice but I decline the deal as I can feel their purpose is keep asking you to pay more money instead of giving you good services. Before I go, when my sister saw that I carry the 2 lousy goodie bags and she asking the staff is this the bag to keep our few thousand photo album? The staff quickly go inside and take out one so called better quality “Destino” bag to put all my album inside. And she told us that is the latest design of their “bag”, and can I know is my package expired and I cannot use it to put my album? Why wait until customer not satisfied only want to give a better service? To: Destino boss: is my RM6K not enough to buy a bag from you to put my few thousand photo album? Or u want me to top-up money to buy a bag to put my album? Why asking us to remove the blog which we share our experience with other potential customer? And what we said is our true experience from your Bridal Shop? I am glad that I came accross this site. very helpful. I'm going down to Destino this weekend and wonder if anyone can give me any tips. I read a lot about Destino from this side, hope it help you too. Hi, I just signed Destino too. Really worry after seeing all the bad reviews. Can you help us to clarify about all the bad comment when you going there this weekend? Before you sign with them, they will bring you around to show you some beautiful gowns and even ask you to try. Ask them to note down those gowns that you like, in case you wanna try it for next gown fitting session. After complaining their bad services through online here, it is really affected their business I guess... And they realize the seriousness of the bad services and empty promise. I return back the photo album to them, and complaining about the bad photo printing quality and request them to change for me. The boss had an appointment with me, and told me that the original photo is spoils, and request me and my hubby to re-select another photo to replace it. We have re-select another photo to replace, and they promise to change for us and will return back to us the photo album within 1 month. Ofcourse the boss have sincerely apologize on the bad services provided, and try to explain to us the situation and also their business strategy. As a client, I also can understand their situation, and since the boss come and apologize to us, we do not want to have any misunderstand in between again anymore by accept his apologize and satisfies with the new photo printing... The boss is really show his professionalism and humble as well. Thank you, brides to be for all the information. I was sourcing for Destino too and even emailed them after what they claimed the package pricing has been sent to me (which I nv received) but they refused to tell me more but wanted me to call them instead. I must say their online photo really impressed me but if the service is bad andi cannot choose gown then forget it. 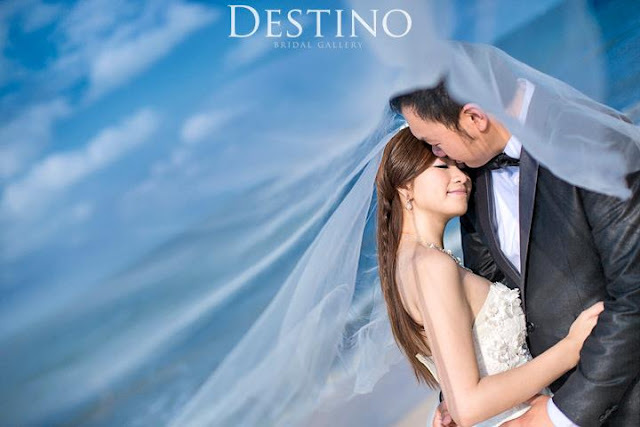 I am going to look for other bridal studio or even cheaper ones as Destino is not exactly very cheap too taking into consideration of their services. Hi anonymous, thank you for your useful and truthful feedback, i need help urgently, i fell in love with destino gown during my firSt visit, i havent sign up yet, joelle have been watsapps me so many times. I am thinking between destino or SG Bridal. 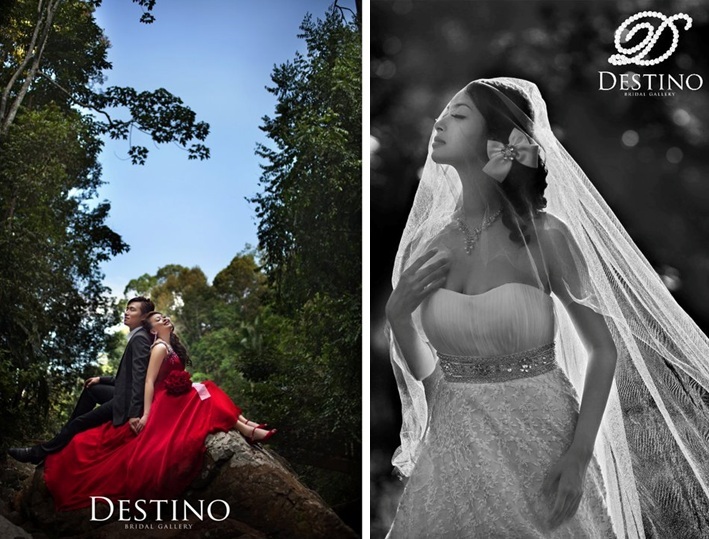 Compare the two, destino gowns looks better SG bridal gown is not nice. So my que is, is destino photographer ok ? Any idea abt SG bridal ? My wedding day is very near i need to make the decision urgently. Their dinner gown has limited of choice, what that show us in the beginning is different in the end. Seriouly if give me 1 more time I wont choose Destino. Outdoor gown also have limited of choice .. All look very 旧e. But cant denied that their customer service is good, they show you very nice gown in the beginning but you will disappointed later. This is what i exprience at there, pls think twice before u signed the packaged. The After Sale Service I got is very bad.. The sale consultant shows her impatient attitude to me just for 4 hours album edition.. Probably she is not concentrating at me but to look for new customer...Design of my album was bad and required me to really look through and giving opinion to make it look better.. The first draft of the design can just tell that the designer wasn't that professional as shown in advertisement...I spent nearly RM9k in total but to get such treatment.. The photos could be missing in the design.. If you don't really count the photos, it could be a loss to you... If you really want to sign a package with Destino.. Please always refer back the package details..